Price: $8.97 & eligible for FREE Super Saver Shipping on orders over $25. See details. Buy this DVD with Bachelor Party DVD ~ Tom Hanks today! * Rated: Not for sale to persons under age 18. * Average Customer Review: Based on 13 reviews. Is there an DVD you'd recommend instead of or in addition to this one? Let the world know! Enter the DVD's ASIN (what's an ASIN?) in the box below, select advice type, then click Submit. Before Tom Hanks was an Oscar-winning megacelebrity, before he became a serious and only sometimes comedic actor, before he won that second Oscar, he starred in both romantic comedies (Splash) and lowbrow comedies (Bachelor Party). More lowbrow than romantic (though he did end up marrying costar Rita Wilson), Volunteers is set in 1962, back when the Peace Corps was all the rage. Hanks, speaking with an unfortunate accent meant to represent aristocratic wealth, plays a compulsive gambler, recently graduated from Yale, whose father suddenly refuses to pay his debts. To escape some particularly shady characters, he joins the Peace Corps and boards a plane headed to Southeast Asia. Back in 1984, Tom Hanks was on a roll. After making it big on the small screen in the popular comedy, Bosom Buddies, and making an even bigger "Splash" in the 1983 film directed by Ron Howard, Hanks started gaining prominance as an actor. His next film, 1984s Bachelor Party, brought his persona to a much different audience which did not stop the film from becoming a success. 1985s Volunteers, however, would be a different story. Although this film is about Ivy Leager, Lawrence Bourne III (Hanks) who joins the Peace Corp to get out of a gambling dept, it is not for a huge audience. However, there are a couple of important reasons to own it. 1. This was the 2nd and final teaming of Hanks with fellow "Splash" costar, John Candy, who's performance in this film as the goodnatured Tom Tuttle can be hard not to laugh at (the brainwashing scene is a killer). 2. 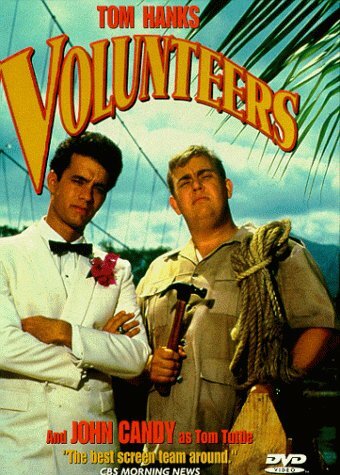 Volunteers is the movie where Hanks met his wife, Rita Wilson, who costars with him as Beth Wexler. It's just a lot of fun to watch the chemestry between these two and also quite touching since they are still together today. One of my favorite scenes is when Beth is unsuccessfully trying to get the natives to move a log, so Lawrence tells her to repeat something he says in their language, and after she does, the natives scurry the log away. "What did I just say? ", she asks him. He replies, "Move this log and I'll sleep with each one of you". A silly but intimate exchange between the two of them. This DVD is not bad as far as price is concerned and it's even shown in the Widescreen Format (1.85:1), but you may not know that since the back of the case is a bit unclear (the only indication is "Aspect 16:9", which some people may not understand). Even the original theatrical trailer is here in Widescreen. Plus you even get some nice Cast & Crew Bios. So if you really enjoy Tom Hanks and/or John Candy, check this film out. This comedy really struck me as great. Some have bashed Tom Hanks in this movie as unfunny and John Candy as the highlight, but I think Tom Hanks is just plain hilarious, but then again I've always loved deap-pan humor. Candy on the other hand is the fallguy to Hanks straightman. The basic plot is Hanks is a rich prick in serious debt and joins the peace corps to get away from it all. While in Thailand, Tom Hanks has to learn to become a better person. Simple premise, but, like I said earlier, you'll love it. Also, this film features and early score by James Horner, which is a nice bonus for soundtrack fans. Truthfully the only reason this film did not get 5 stars was the lack of DVD features, but the flick itself is great. Worth your cash. I'd actually like to give this 0 stars. This lame film set in Southeast Asia is a complete waste of time. I love John Candy and miss him very much, but would not watch this film again even if it was the only way to see John. And Tom Hanks has become one of greatest livingg actors. That being said this film stinks. It is a poorly written about some peace corps types dealing with some way over done CIA types. Rent or by Plains, Trains or Automobiles, you'll be a lot happier. Any movie which contains the fight song of the greatest university on the face of the Earth, no doubt, is worth five stars if not more. Besides that, it is just a great movie. Go Cougs!!!! !